The Open Space Institute (OSI), the South Carolina Ports Authority (SCPA) and Pee Dee Land Trust (PDLT) today announced a major land conservation achievement aimed at improving the water quality of the Little Pee Dee River. The project will permanently protect 78 acres near the source of the 116-mile river. The “Little Pee Dee River” property, located outside the town of Dillon, SC, consists of forested wetlands important for wildlife, groundwater recharge and water quality. As a result of this important conservation project, the property will be permanently protected from future cutting or disturbance. Research has shown that intact watershed forests act as a natural filter to clean drinking water downstream and can moderate the flow of water, reducing the risk of flooding downstream. The protection of the Little Pee Dee River property was made possible through wetlands mitigation funding associated with the South Carolina Ports Authority’s new Inland Port Dillon. 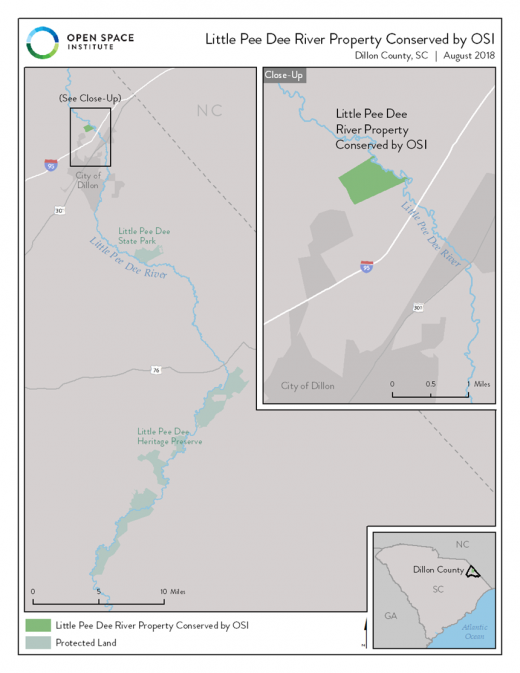 Under the structure of the acquisition, the property was secured by OSI and has been transferred to Dillon County, with Pee Dee Land Trust holding a conservation easement. The newly protected property is located in a conservation priority area for state and federal agencies, conservation groups and private landowners. It is also near or adjacent to other privately- and publicly-protected properties, including the state’s Little Pee Dee State Park and the Little Pee Dee Heritage Preserve. The Little Pee Dee River is a 116-mile black water tributary of the Pee Dee River. The Little Pee Dee flows past cypress-tupelo swamps, ancient sloughs, and sandy stream bottoms, and is a popular recreation destination for fishing and boating. Since 2013, OSI has protected more than 9,000 acres in South Carolina, including the addition of nearly 6,000 acres to the Francis Marion National Forest; the transfer of Pappy’s Island to the Cape Romain National Wildlife Refuge; and land along the Black River. With this as its 69th conservation project to date, Pee Dee Land Trust has now protected over 27,693 acres in the Pee Dee Region. While remaining in private ownership, the lands protected through conservation easements held by PDLT ensure that special places will be available for farming, forestry, and recreation for future generations. The Open Space Institute protects scenic, natural and historic landscapes to provide public enjoyment, conserve habitat and working lands and sustain communities. Founded in 1974 to protect significant landscapes in New York State, OSI has been a partner in the protection of nearly 2.2 million acres in North America. A leader in environmental conservation, OSI leverages our knowledge and attracts resources for strategic investments to make innovative land conservation happen. Visit OSI online at www.openspaceinstitute.org. Pee Dee Land Trust focuses on the Pee Dee watershed, which covers nine+ counties of the Pee Dee region in South Carolina: Chesterfield, Darlington, Dillon, Florence, Georgetown, Horry, Marion, Marlboro, and Williamsburg. Its mission is to protect, and to promote an appreciation of, the significant natural, agricultural, and historical resources of the Pee Dee Region through voluntary land conservation and educational programs. More information at www.peedeelandtrust.org.